Ever wonder what activities Ridgefield students participate in when they are in PE class? 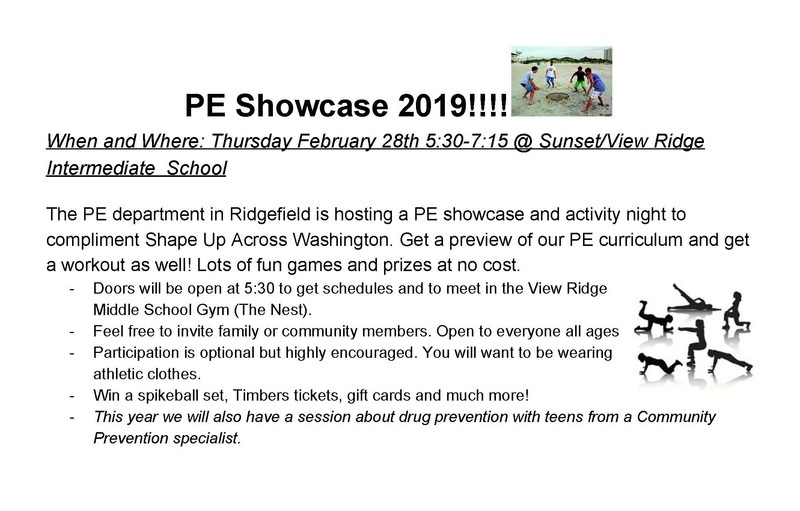 Come to “PE Showcase 2019” on Thursday afternoon, February 28th and get a preview of the district’s PE curriculum while getting a workout at the same time! Participate in lots of fun games with a chance to win prizes. This is a free, family-friendly community event with activities for all ages. Athletic wear is highly recommended. The district’s Physical Education Department is hosting the event as part of the “Shape Up Across Washington” program, whose goal is to encourage daily physical activity and a healthy lifestyle for elementary and middle school students. Participation is highly encouraged. Doors open at 5:30 pm at View Ridge Middle School Gym (The Nest). Activities include fitness challenges that test endurance, strength and flexibility. Learn yoga, play spikeball, badminton and pickleball games. In addition, learn about drug prevention for teens in a session offered by a Drug Prevention Specialist from ESD 112. The showcase wraps up at 7:15 pm with a raffle drawing for prizes. Enter to win Timbers tickets, a spikeball set, gift cards, and much more!